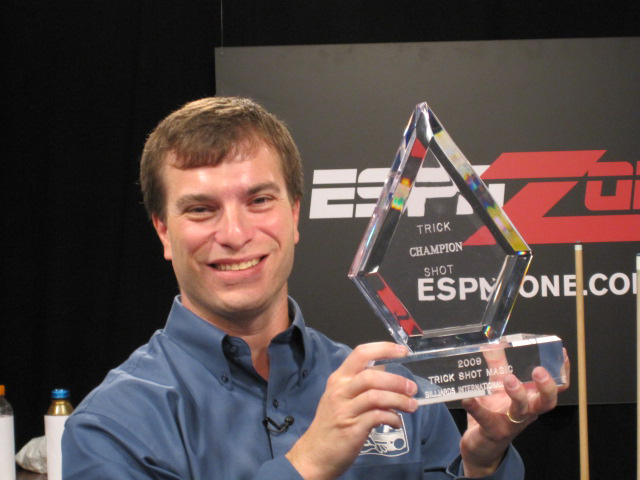 The 2009 ESPN ZONE BILLIARDS SHOOTOUT was held September 17 in Las Vegas. Andy Segal defeated Sebastian Giumelli for the TRICK SHOT MAGIC title and the lion’s share of the $30,000 purse. ESPN Zone Las Vegas was host to the event which was taped for three 1-hour telecasts on ESPN November 22. The Tenth Annual TRICK SHOT MAGIC featured a stellar international cast vying for the most coveted title in Artistic Pool. The matches required each player to execute 10 Artistic shots in a challenge format. 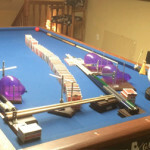 Players challenged their opponents with shots of their choice, with each player forced to make the shot to score a point. In the event of a tied score, the tiebreaker was an 8-rail bank shot onto the face of a $100 bill. The player who came closest to the center of the bill won the match. Segal, of the USA and Giumelli, of Argentina displayed their brilliance to emerge as the top trick shot artists. The Championship Match was poetry on green felt, with Segal defeating Guimelli by a score of 9 – 4 to take the crown and $10,000. Giumelli, who otherwise played to top form in the event, claimed $5,000 second prize. In the semifinal action, Segal prevailed over Nick Nikolaidis of Canada by the narrow margin of 7-6. The other semifinal saw Giumelli slip past Eric Yow of the USA 7-5 in a tight match. International trick shot stars who were bumped off in single elimination included Nikolaidis and Yow, who won $3,000 each, and Tom Rossman (2008 Trick Shot Magic Champion), Jamey Gray (2008 World Champion), Stefano Pelinga (2007 Trick Shot Magic Champion), and Bruce Barthelette (2008 World Cup Trick Shots Champion) who won $2,250 each. The standing-room-only crowd gave Andy Segal a spirited ovation at the conclusion of the final match. 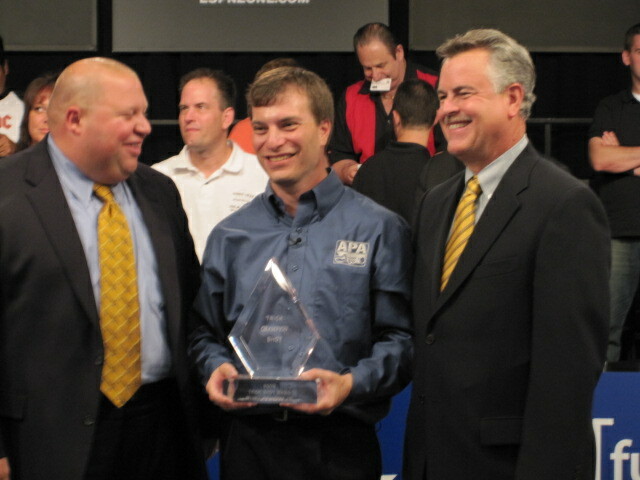 The winners check was presented by Fusion Tables and Delta-13 Racks. The presentation brought another round of cheers from the audience. 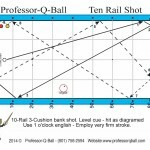 In addition to the fine tournament site at ESPN Zone Las Vegas at the New York New York Hotel & Casino, the event was sponsored by Fusion Billiard Tables, Aramith Super Pro Balls, Simonis Cloth, Mueller Recreational Products, Executive Billiards Delta-13 Rack, AcCue Shot Target Practice Device and Silver Cup Chalk. 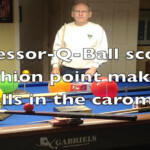 The WPA sanctioned event was produced by Billiards International, Ltd.